Natural hazards cost the global economy over $50,000 million per year. Two thirds of this is spent on damage repair, the remainder represents the cost of predicting, preventing and mitigating against disasters. Man-made hazards such as groundwater pollution, subsidence and soil erosion add to this figure. Geological Hazards is the first book to consider both natural and man-made disasters in a single volume. All major geological hazards are examined. It presents a state-of-the art survey for students on civil engineering and physical geography courses, as well as researchers and practicing civil engineers. 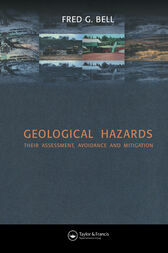 It examines methods of assessing, evaluating and combatting hazards, both natural and man-made. Richly illustrated, it views the subject from an international perspective.